Huntingtin takes a trip: harmful proteins pass between brain cells - HDBuzz - Huntington’s disease research news. Clumps of mutant huntingtin protein in brain cells are a hallmark of HD, and they build up slowly, occupying more and more cells over time. Recent research in mice shows that the harmful proteins can travel between neurons, setting off a chain reaction that leads to more sick cells and the development of symptoms. A person diagnosed with a neurodegenerative disease, such as Huntington’s, Alzheimer’s, or Parkinson’s, will develop symptoms progressively, meaning that they begin gradually and worsen over time. The progressive nature of Huntington’s is reflected within the brain, where cells controlling mood and movement become vulnerable to damage, then decrease in numbers over the course of many years. At the same time, neurons all over the brain slowly become littered with clumps of biological trash. 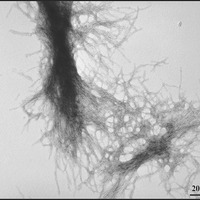 A picture of purified mutant Huntingtin protein aggregates formed in the lab. These clumps of protein are also found in the brain cells of people with HD. These harmful clumps, often called “aggregates,” contain abnormal huntingtin protein along with other sticky gunk. Even though every cell in an affected person’s brain contains the HD mutation, aggregates don’t show up everywhere all at once – they appear in a small percentage of cells at first, and eventually become widespread throughout the brain. The question of how this massive buildup occurs is the subject of ongoing research. A recent study provides strong evidence that an affected cell can pass mutant huntingtin on to its neighbors, by oozing the protein into the vicinity of unsuspecting healthy cells. In turn, these cells then develop aggregates and succumb to their harmful effects. In unaffected mice, a transplant of cells containing the HD mutation was toxic enough to induce HD-like behavioral symptoms. This finding has important implications for the design of current and future therapeutics for HD. The mutation at the root of Huntington’s disease causes a single protein, huntingtin, to be extra-long and difficult to fold. Compare the task of folding a big pile of fitted sheets versus flat top sheets – one is more likely to lengthen your laundry day. You can choose to leave your sheets in a big jumble, but proteins need proper folding into the correct 3D shapes to function optimally. When this fails, misfolded proteins build up and cause lasting damage, the scourge of neurons in almost every known brain disease. In a person with HD, the mutation is present in every part of the brain and body, so each individual cell has the huntingtin misfolding problem on its hands. For reasons we don’t understand, some cells succumb early to this setback and accumulate harmful clumps of mutant huntingtin. Others develop these aggregates much later, or not at all. The idea that an aggregate forms independently in each cell is called “cell-autonomous” aggregation, and this was the assumption of brain scientists for many years. In just the past decade, however, a “non-cell-autonomous” theory has emerged, where aggregates formed in one cell can be transmitted to neighboring cells. This phenomenon has been observed in petri dishes and in mouse models of other neurodegenerative disorders, including Alzheimer’s, Parkinson’s, and ALS. In the HD field, several studies have hinted that mutant huntingtin protein can pass from cell to cell, both in dishes and even in humans. Recently, a group of trans-global collaborators in Korea and Canada showed more definitively that cells can actually release mutant huntingtin onto healthy neighbors and make them sick. Researchers led by Jihwan Song at CHA University in Korea began by obtaining fibroblasts from volunteer HD patients. Fibroblasts are a type of skin cell that scientists can grow in a dish and experiment on directly, or they can amazingly be “reprogrammed” to resemble brain cells. The research team did surgery to implant HD fibroblasts or reprogrammed nerve cells into the brains of healthy newborn mice, which developed and grew into adulthood normally. But around eight months later – middle age for a mouse – the scientists began to see signs of illness. The mice slowly developed problems with movement and thinking, like difficulty navigating through a water maze, and weakness in their limbs. Their brains showed signs of sick and dying cells in the striatum, the most vulnerable region in Huntington’s disease. From a graft of human cells carrying the HD mutation, totally normal mice had developed behaviors and pathology reminiscent of HD. A striking observation was that the mouse brain cells, which did not carry the HD mutation, had developed huntingtin aggregates! This is strong evidence that the implanted mutant cells were able to pass abnormal huntingtin protein to their healthy neighbors, effectively getting them sick. So how can a mutant protein spread between cells like an infection? The answer may lie in tiny messenger compartments called exosomes. These are structures that help neighboring cells communicate by sharing chemicals and proteins. Cells are encased in membranes, curved fatty barriers against the outside, like a big bubble. The membrane can pinch off a teeny tiny portion of itself to form a new little bubble, packed with cargo it wants to send to a cell down the lane. The little bubble merges with a new cell, and pop! The contents are now inside that cell. To understand how the implanted HD cells were able to infect their neighbors, the scientists grew HD skin cells alongside healthy cells in dishes. When cells are grown in a dish in the laboratory, they live submerged in a bath of nutrients, so when exosomes are released, they enter the bath. Just like in the mouse brains, the neighbors of HD fibroblasts began to show signs of sickness – and they eventually developed huntingtin aggregates. Floating in the bathwater from the HD cells were exosomes containing mutant huntingtin, which merged with healthy cells, exposing them to harmful misfolded protein. The final evidence that exosomes were the culprit came from another experiment in mice. The researchers isolated exosomes from the bathwater of HD fibroblasts using a series of pressure and filtration steps, the chemical equivalent of draining pasta through a strainer, on a microscopic scale. When they separated out the HD exosomes and transplanted them into the brains of newborn mice, those mice grew up and developed huntingtin aggregates as well as behavioral signs of HD. So mutant huntingtin proteins can travel from cell-to-cell via exosomes, infecting one another and perhaps speeding up the buildup of harmful aggregates. This study is a clear example of how an improperly folded disease protein can trigger a chain reaction in healthy cells, making them sick, too. 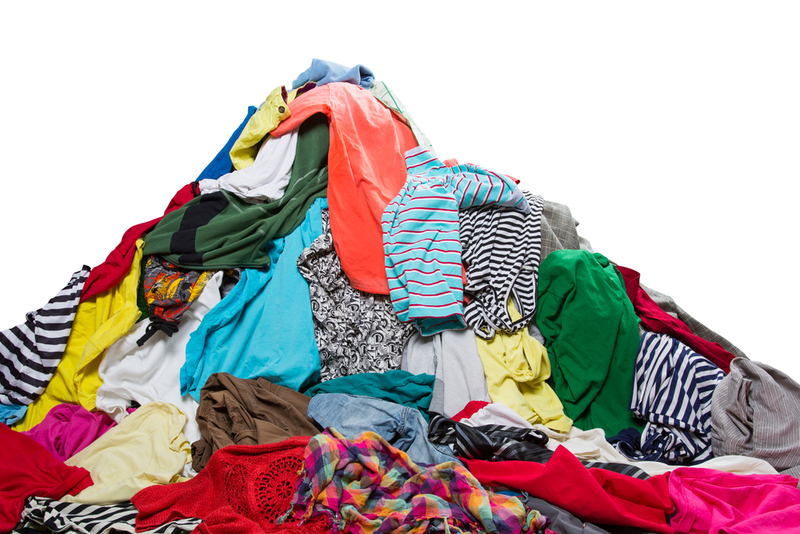 In the HD brain, it’s possible that some misfolded mutant huntingtin gets packaged into exosomes because it’s simply a way to unload an insurmountable pile of laundry. When a sick cell’s neighbor is already genetically vulnerable because it too has the HD mutation, receiving that extra pile of work could push it over the edge, leading it to develop its own aggregates. The results of this work are extremely informative for the design of current and future therapies for HD. In particular, our approaches to cell replacement therapy and gene silencing will be shaped by the knowledge that mutant huntingtin can travel between cells. The tactic of cell replacement therapy – filling in brain areas damaged by HD with new, healthy cells – may unfortunately be impractical, if the new cells are likely to acquire aggregates from their neighbors and become sick. As for gene silencing (shutting off the HD gene), some of our current approaches involve localized delivery of drugs to a vulnerable part of the brain. This approach has been promising, but it’s extremely difficult to get a drug into every single cell. We will have to take into account that it could be possible for untreated cells to pass mutant huntingtin back into treated cells, undermining the treatment. Well-designed research showing that cell-to-cell transfer of abnormal huntingtin is plausible has provided an essential piece of information that will extend our ability to develop and assess future therapies. Finally, using this knowledge to stop the spread of aggregates is a new avenue to investigate in HD.